On the blue planet, water is the source of all life – and one of the most potent sources of conflict. Without consistent access to this limited and increasingly unpredictable resource, fertile fields go barren, wildlife populations dwindle and communities suffer devastating consequences. And yet, water offers a common denominator around which to unite. Water crises around the world are spurring innovative new technologies and inspiring diverse stakeholders to work together on equitable solutions. California tells this story like no other place. 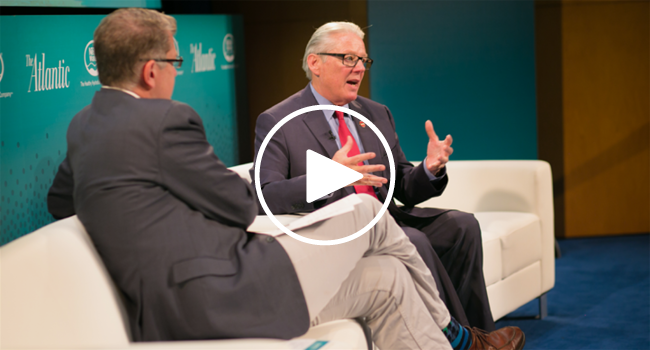 At the Water Summit, The Atlantic gathered the leading voices in water, from environmentalists and policymakers to growers, industry leaders and community representatives, to forge a dialogue around the critical water issues of our time. With an eye toward the future, The Atlantic discussed the challenges, the solutions and the ways that the latest innovations can work to make water safe, reliable and accessible for years to come. *This session was produced by Nestlé Waters North America and not by The Atlantic's editorial team. *This speaker participated in a session that is produced by Nestlé Waters North America, and not by The Atlantic's editorial team.